"Thank you to God for making me an atheist." The Golden Globes promptly announced the next day that Gervais was "banned from hosting" the awards ceremonies again. Isaiah 7:9b NIV "If you do not stand firm in your faith, you will not stand at all." It really bothers me that some atheists/agnostics believe those that have faith are crazy. Such people as Gervais and a hugely popular tech blogger named John Gruber have, as their popularity has risen, gone out of their way to be two-faced and outright rude to people of faith. For both, the jabs are not only unnecessary, but non sequitur. I always look at atheist snobbery as an opportunity to grow in my own faith. In November of 2007, Daring Fireball's John Gruber posted a link to a pun-filled piece that poked fun at the newly opened Creation Museum in St. Petersburg, Kentucky. When I read it, it piqued my interest considerably. I doubt I would have heard of it (as soon as I did) had it not been for Gruber's "Ha ha! These people are nuts" type posts. When he linked this about the movie Expelled with the summary, "If you like to laugh at creationists, you’re going to love this story" my curiosity was elevated once again. I ended up going to the theater to see this documentary and came away even more interested in the topic of faith, the science of our existence, and the realization that I should prepare to defend my beliefs should the day come. Within the Expelled credits, I noticed another documentary that was done for the Discovery Channel called The Privileged Planet. I ended up obtaining The Privileged Planet and found that it provides hard, detailed, irrefutable science about Intelligent Design. Gruber consistently links to articles that ridicule people of faith. The links often are from intellectuals who are respected for their talents and education - as if it lends credence to his own beliefs (or disbelief as the case may be). 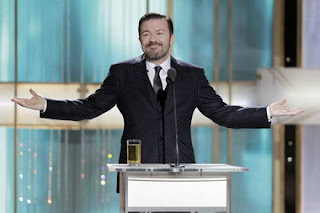 On several occasions, Gruber has linked to essays by infamous atheist and Oxford professor Richard Dawkins and it goes without saying that he linked to the "Ricky Gervais Holiday Message" mentioned above. While I fully believe 50%+ of the world's population could be declared insane ... I also believe that out of the other 50% of sane people that have a concept of God, base it on true genuine, genius introspection. There is no question in my mind that there is a God ... the biggest proofs to me; The Bible and those that discover its constant, timeless meaning to life AND those that misinterpret it or don't read it and bring constant chaos to their life, lack of salvation, and introspective wisdom. * I'm in no way linking belief in creation with atheism, just pointing ridicule of people with faith.